COLORADO SPRINGS, Colorado, June 27, 2012 (ENS) – An intense fire swallowed dozens of houses overnight in Colorado’s second-largest city, while choking smoke and raging towers of flame kept fire operations managers from assessing the full extent of the damage. 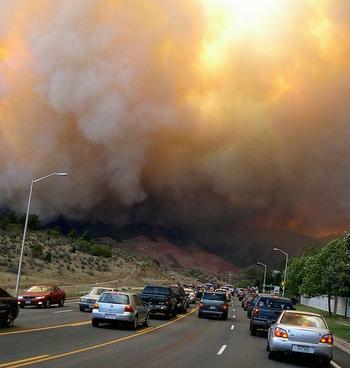 The Waldo Canyon Fire was discovered on Saturday in Pike National Forest near Colorado Springs. To date, it has burned 15,517 acres, was just five percent contained, and had forced at least 32,000 people to evacuate their homes. Among those evacuated Tuesday night were residents of the U.S. Air Force Academy in Colorado Springs, where fire scorched the borders of the grounds today. More than 760 federal, state and local firefighters and six helicopters are fighting the aggressive Waldo Canyon fire today on the hillsides west of Colorado Springs. Additionally, a total of nine large airtankers, including four military C-130s equipped with Modular Airborne Fire Fighting Systems, are currently in Colorado working on the Waldo Canyon and other fires in support of local officials who are leading the fight against the wildfires. President Barack Obama today told Colorado Governor John Hickenlooper as well as Colorado Springs Mayor Steve Bach that he plans to travel to the area Friday to view the damage and thank the responders bravely battling the fire. On calls to the two officials to receive an update on the fires, the President reiterated that his administration’s focus, through the U.S. Forest Service, the Department of the Interior and the Federal Emergency Management Agency, is on continuing to bring all resources to bear to assist local responders in Colorado and other western states now battling wildfires. Seventeen air tankers have cycled in and out of firefighting action over the last 48 hours across the western states. More than 8,400 personnel, 578 fire engines and 79 helicopters are operating on wildfires around the United States, with more than half of active federal wildfire-fighting resources currently staged in Colorado. Federal support is also being provided to local officials fighting fires in Alaska, Arizona, California, Montana, Nevada, New Mexico, Utah and Wyoming. The President said he has directed his team to remain focused on the fires. He asked the governor and the mayor to identify any additional resources that could be provided and informed both that his thoughts and prayers are with responders and families impacted by these and other fires burning across the western United States. 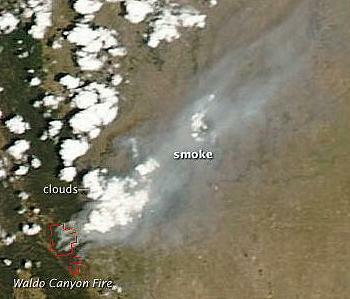 The Waldo Canyon fire stretches in three directions across very dry forests. The fire has consumed more than 15,500 acres of forested land since Saturday. With low humidity, winds as high as 65 mph and temperatures in the 90s forecast for the coming days, the situation remains challenging as firefighters work in what is described as very difficult terrain. Earlier today, FEMA’s National Watch Center in Washington, DC elevated to an enhanced watch level, which means that additional personnel are assisting with monitoring activities related to the wildfires. On Sunday, FEMA approved Fire Management Assistance Grants, FMAGs, that authorize the use of federal funds to help states and local governments with firefighting costs for the Waldo Canyon Fire in El Paso County, Colorado; the Weber Fire in Montezuma County, Colorado; and the Hollow Fire in Sanpete County, Utah. These grants make FEMA funding available to pay 75 percent of the state’s eligible firefighting costs for managing, mitigating and controlling the fire. They do not provide assistance to individual home or business owners and do not cover other infrastructure damage caused by the fire. On June 6, FEMA approved a FMAG for the High Park Fire in Larimer County, Colorado, and on June 22 approved a FMAG for the Eagle Mountain/Dump Fire in Utah County, Utah.